PB & J is a favorite for just about every kid. It’s no wonder then that this would be such a popular muffin with children. A healthy muffin, it can be made ahead and stored in the freezer for up to two weeks. To defrost just remove from the freezer and bring to room temperature, then store in an airtight container for up to three days. 1. Preheat oven to 350 degrees F and prepare a muffin pan. 2. In a large mixing bowl sift together the flour, baking powder, baking soda, salt, maple sugar, and cinnamon. Add oats, raisins, and half of the peanuts. 3. In another bowl combine the soy milk, canola oil, maple syrup, vanilla, peanut butter and vinegar and bananas and mash until the ingredients are well-blended, then pour into the dry ingredients, stirring to mix. Take care not to over mix. 4. 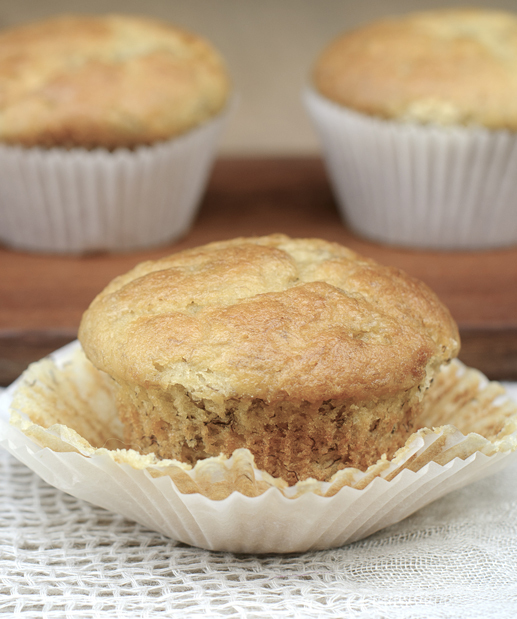 Fill muffin cups 2/3 with batter, then squirt a little jam onto the top of each muffin. Sprinkle tops with peanuts and bake for approximately 20 minutes.